Mesopotamia History and Archeology Resources Rubin's painting "ATROCITY 911"
which were the basis of civil law in ancient Akkad and Summer. These were recorded as the 7 Laws of Noah by the Aramaens of northern Mesopotamia. 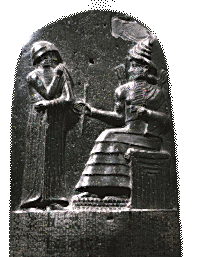 "HAMMURABI" a King of ancient Mesopotamia created a code of humane laws which became the basis for modern law. The United States Constitution among other great documents owes much to Hammurabi's Code of Laws. We have chosen to publish them on this website to illuminate the ethics which Mesopotamian Christians and Non-Muslims hold dear even now during the most perilous time in their history. "Mesopotamia Now 2008" is testament to the courage and strength of the people who created civilization, written language, agriculture, science and so much more. 9. If any one lose an article, and find it in the possession of another: if the person in whose possession the thing is found say "A merchant sold it to me, I paid for it before witnesses," and if the owner of the thing say, "I will bring witnesses who know my property," then shall the purchaser bring the merchant who sold it to him, and the witnesses before whom he bought it, and the owner shall bring witnesses who can identify his property. The judge shall examine their testimony -- both of the witnesses before whom the price was paid, and of the witnesses who identify the lost article on oath. The merchant is then proved to be a thief and shall be put to death. The owner of the lost article receives his property, and he who bought it receives the money he paid from the estate of the merchant. 33. If a ... or a ... enter himself as withdrawn from the "Way of the King," and send a mercenary as substitute, but withdraw him, then the ... or ... shall be put to death. 34. If a ... or a ... harm the property of a captain, injure the captain, or take away from the captain a gift presented to him by the king, then the ... or ... shall be put to death. 100. ... interest for the money, as much as he has received, he shall give a note therefor, and on the day, when they settle, pay to the merchant. 111. If an inn-keeper furnish sixty ka of usakani-drink to ... she shall receive fifty ka of corn at the harvest. 180. If a father give a present to his daughter -- either marriageable or a prostitute (unmarriageable) -- and then die, then she is to receive a portion as a child from the paternal estate, and enjoy its usufruct so long as she lives. Her estate belongs to her brothers. 274. If any one hire a skilled artizan, he shall pay as wages of the ... five gerahs, as wages of the potter five gerahs, of a tailor five gerahs, of ... gerahs, ... of a ropemaker four gerahs, of ... gerahs, of a mason ... gerahs per day.